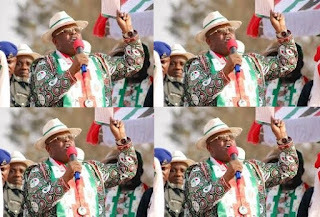 Ebonyi state governor, Dave Umahi, has warned traders in the state that they risk the chance of losing their shops forever if they obey the sit-at-home order issued by the proscribed Indigenous People of Biafra group, IPOB. The group had called on their members to sit at home today May 30th as they honor all their members that have lost their lives in the struggle for the creation of Biafra. Governor Umahi made the declaration while giving his democracy speech in Abakaliki, the state capital yesterday May 29th. In a related development, the Anambra state governor, Willie Obiano, has also warned civil servants in the state to resume work today or risk having a sack. The order contained in a statement issued by the Anambra state Head of Service, Harry Udu, is to ensure that the reisdents of the state do not comply with the directive of the proscribed group. IPOB in a statement released by its Deputy Leader, Uche Mefor, titled: ‘May 30 Sit At Home, says the order is about respecting those who fought and died for your freedom’. The statement said it has sent out canvassers to interior villages of Biafra land to sensitise the people on the need to obey the order, and have gotten favourable response that compliance would be high.